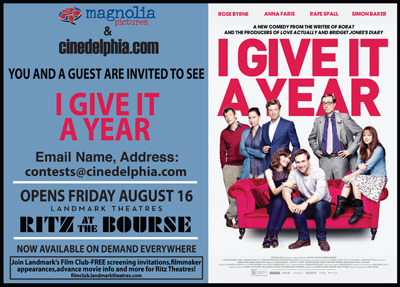 We’re giving away a bunch of pairs of movie tickets to see I Give It a Year at the Ritz at the Bourse. To enter, e-mail us your mailing address. Winners will be chosen at random, only one entry per household please. Newlywed couple Nat (Rose Byrne) and Josh (Rafe Spall) are deliriously happy despite their differences, though friends and family aren’t convinced that they can last. With their first anniversary approaching and attractive alternatives in the mix, can they last?